The APC is still at a loss whether the governor made this statement and if he truly did so, then he qualifies to be the greatest living soul in the art of fantasy and make-believe. Rivers people nay Nigerians know that Gov. Nyesom Wike’s strategy for political survival is to purchase and pocket the police, other security agencies and the judiciary. Examples of his escapades abound for all to see. We believe that the assertion is a sign of frustration after his pact with the erstwhile Inspector-General of Police, Mr. Solomon Arase to plant a Police Commissioner in Rivers State to do the governor’s bidding collapsed as a result of the work of providence. It is on record that specific senior police officers that are at Wike’s beck and call in Rivers State who were recently posted out of the State have started finding their way back. The governor is simply crying wolf to cover his ignominious tracks. Gov. Nyesom Wike cannot talk about security architecture for Rivers State when his dismantling of the near perfect security arrangement the former governor, Rt. Hon. Chibuike Rotimi Amaechi put in place has since resulted into the present security basket case in Rivers State. The APC strongly believes that Gov. Wike actually intended to quarrel with the efforts by the Police to alter the ‘insecurity architecture’ he deliberately installed in Rivers State. Indeed, Gov. 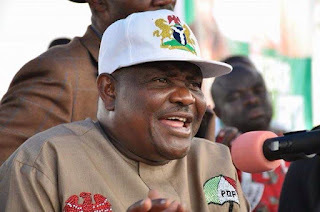 Wike it was that dismantled the Israeli-trained C4i unit that banished kidnapping and other dangerous crimes in Rivers State during the administration of Rt. Hon. Chibuike Rotimi Amaechi. The APC recalls that it was the PDP and Nyesom Wike that revived, activated and franchised already dismantled cult groups across the State for the purpose of killing and hijacking the 2015 election results in Rivers State. It is on record that the governor has now realised that he cannot rein in his creation that has become classical Frankenstein monster. His recent cosmetic attempts to appear to be fighting criminality is only to fool the public while the real motive is to compensate his private armies across Rivers State and prepare them for the forthcoming rerun elections. The APC calls on the new Inspector-General of Police and other security chiefs to ignore Gov. Nyesom Wike’s antics by ensuring that his mafia-type strangle-hold on the Nigeria Police and other security agencies is finally broken and laid to rest.